Knead-a-Mold® is our exclusive, two-part, platinum cured silicone mold making system that is safe and so easy to use. It works beautifully with resins. More details below. 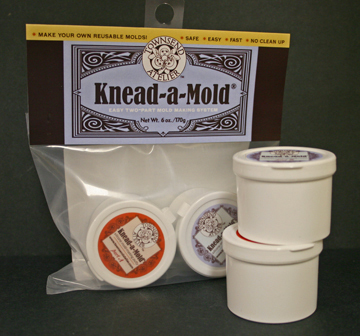 Knead-a-Mold® is an exclusive, two-part, platinum cured silicone mold making system that is safe and so easy to use. It works beautifully with resins, low temperature melt metal alloys, paper and air dry clays, polymer clay, wood putty, chocolate and more! Excellent for replicating vertical, small or hard-to-reach areas. Non-toxic and food safe, Knead-a-Mold can be baked at up to 300 F constant temperature or 600 F intermittently. No special equipment, tools or release agents are needed. Can be used with the exclusive Brush-a-Mold™. Perfect for sculpture, restoration, jewelry, crafts and hobbies, taxidermy, candy, chocolate, soap, candles and more! B (blue putty) into two separate equal sized balls. the color is uniform, you are ready to begin your mold. Press the kneaded mixture onto the surface of the object you wish to replicate. rubber mold that can be used over and over again. Gently loosen and pull the mold from the object. Allow the mold to cure for at least 1 hour before using. If using your mold for food (candy, chocolate, marzipan, etc. ), wash fully cured mold in the dishwasher or in warm soapy water to sterilize before molding. Make sure mold is completely dry before molding. Remember to reserve any food molds strictly for food — do not use the same molds for clay and other crafts and visa versa. 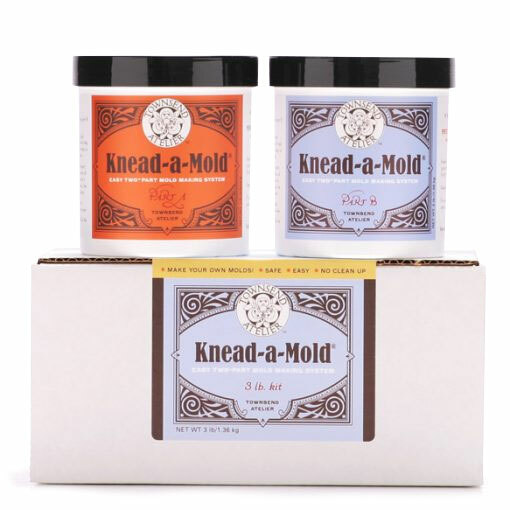 Knead-a-Mold can be used with Brush-a-Mold — the two will bond to each other. Knead-a-Mold is thermal set silicone so cure time and pot life will be shorter in higher temperatures. For two part molds: once the first half of your mold is completely cured, you may create a “key system” to lock the second half of your mold by cutting a small trench with an exacto knife around the top surface of your mold. is applied, mix a second batch of Knead a mold and place on top of first mold. knife) a small hole or vent in which to pour resin, chocolate, etc.